New – ANS Continuing Education! With the current issue of ANS, we have launched Continuing Education for at least one article each issue! When you visit the online Table of Contents of each issue, you will see a red “CE” symbol, indicating that you can visit the ANS page on Nursing Center CEConnection to proceed with the process to obtain continuing education credits. In the current issue, CE credit is available for the article titled End-of-Life Communication: Nurses Cocreating the Closing Composition With Patients and Families by Mary J. Isaacson and Minton, Mary E.
A Qualitative Study of Difficult Nurse-Patient Encounters in Home Healthcare by Mary Kate Falkenstrom that appeared in ANS 40:2, April-June 2017. 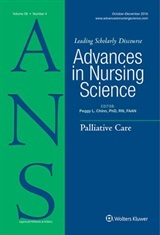 Embedding a palliative approach in nursing care delivery: An integrated knowledge synthesis by Richard Sawatzky, Pat Porterfield, Della Roberts, Joyce Lee; Leah Liang, Sheryl Reimer-Kirkham, Barb Pesut, Tilly Schalkwyk, Kelli Stajduhar, Carolyn Tayler, Jennifer Baumbusch, and Sally Thorne that also appeared in ANS 40:2, April-June 2017. These articles, and the future articles that will be available for continuing education, have implications for practice, education, policy and research. I trust that this new initiative will provide an important resource for our discipline!